When you’ve got the two best selling products in an industry that just set new records for sales and revenues it’s pretty much a sure thing that your own numbers are going to be good. On Thursday, Nintendo confirmed their numbers weren’t just good, they were great. Net profits for the period from April to December nearly doubled, rising 96% year over year. Income was 258.9b yen (approximately $2.4billion depending on the conversation rate), up from 131.9b yen ($1.23b) for the same period last year. Sales were up 85% to 1.32 trillion yen from 712.59 billion yen last year. Globally, Nintendo says they have sold more than 20 million Wii consoles since the platform’s launch in November 2006. 14.3million of those consoles sold in 2007. The DS portable sold 24.5m units in the 9 months ended December 31. Life to date, the platform has had cumulative sales of 64.79m units. In the U.S. market, according to NPD sales data for calendar year 2007 released last week, Nintendo easily took the top two slots for hardware sales. The portable D.S. console sold 8.5m (17.65 life to date). The Wii sold 6.29m consoles in 2007 (7.38 Life to date). For perspective, the Microsoft Xbox 360, the closet competitor in annual unit sales, sold only 4.62m consoles during the same period. In response to this overwhelming popularity, Nintendo raised their operating profit forecast by 40b yen ($372m) to 460b yen ($4.3b). They’re predicting annual sales will be 69% higher than expected, falling in at 1.63trillion yen (15.2b). Nintendo also up-adjusted forecasts for total unit sales for their fiscal year ending March 31st. 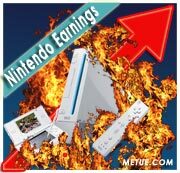 They’re now predicting they will sell 18.5m Wii’s (up from 17.5m). They expect to sell 29.5m DS units, up from earlier projections of 28million. Nintendo has raised sales forecasts three times this year, so far. Demand, it seems, continues to outpace their expectations.